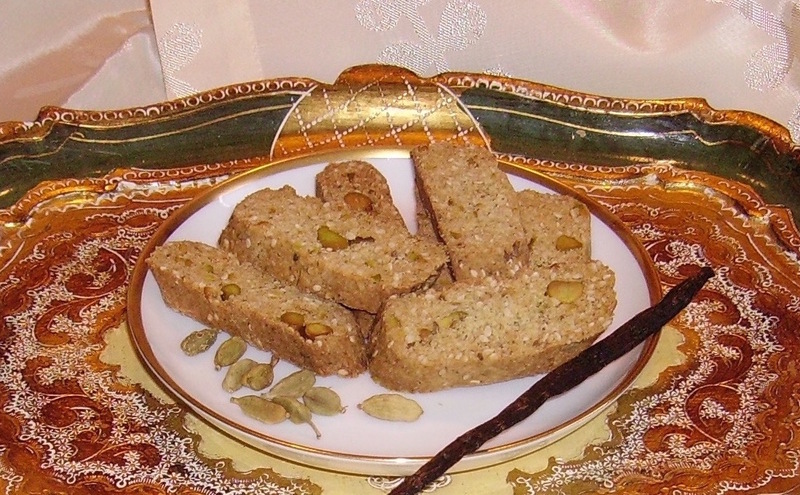 These biscotti are easy to make and have a beautifully oriental touch due to the sesame seeds, pistachios and cardamom. You also might try to add some rose water or orange blossom water - I know I will do it next time! Maybe reduce the butter a bit when you do it. You can even make them with normal plain old wheat or spelt flour if you're not gluten intolerant. Just skip the xanthan if you do. Lightly beat the egg (just to break it up, not until it gets foamy). 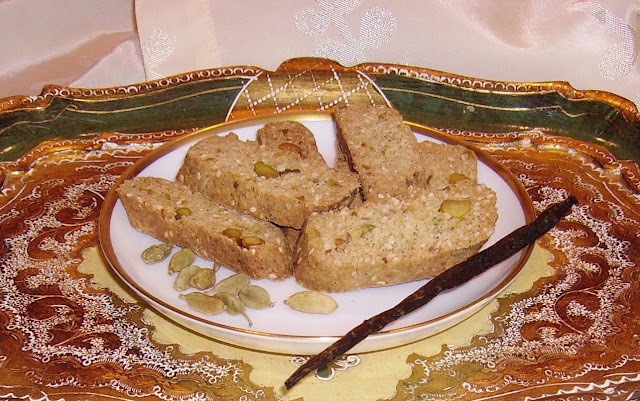 In a bowl, combine almond meal, sorghum flour, potato starch, powdered sugar, baking powder, xanthan gum, vanilla if using real vanilla, cardamom and anise seeds. If using vanilla extract, add it to the lightly beaten egg. Preheat oven to 320°F / 160°C (fan assisted). Add cold butter cubes to the dry mix, cut into the flour with a pastry cutter or a fork until crumbly. Add pistachios and sesame seeds, stir, then add in lightly beaten egg. Knead until dough comes together, then dump the dough onto a large cutting board. Divide into two equal pieces. 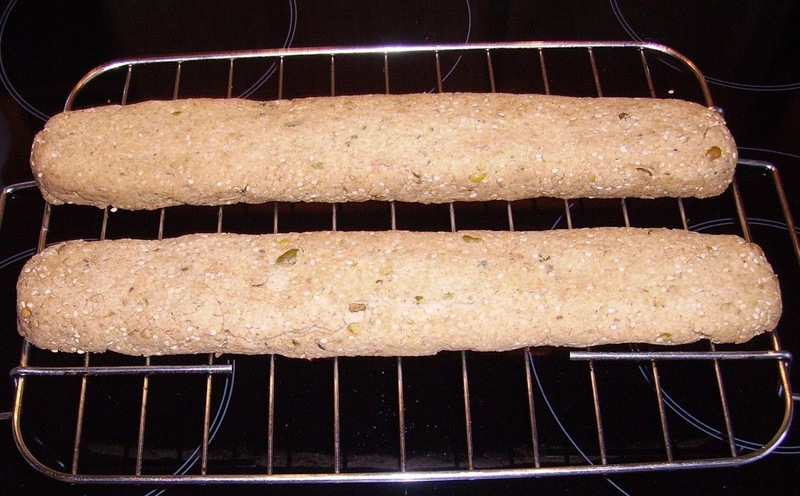 Shape each lump of dough into a loaf which is about 11-12 inches long, 3/4 inches high and 2 inches wide. Place on a parchment lined baking sheet and bake in preheated convection oven for 20-30 minutes (mine took 25 minutes) until golden brown. Let cool for at least 20 minutes, then cut diagonally into 1/2 inch slices. Place on parchment lined baking sheet and bake in a static oven at 320°F / 160°C for about 23 minutes. Let cool completely and store in airtight container for up to 14 days.